In partnership with ICS (Intercontinental Church Society) we have stepped into a new partnership in mission with the Rev Bob Hurley and the Church of St Marc’s Grenoble, France. This is something of great Gospel value as we respond very directly to the teaching of 3 John, in prayerfully supporting and helping to fund the ministry of Bob and his wife Jane, who are mission partners with ICS. Bob and Jane took on the post in Grenoble in a bold step of faith, in the knowledge that the funds weren’t in place to fund their pension and that there was only a half stipend available. God has now begun to meet their faith with the Church Commissioners funding their pension and our Parish together with three or four other Parishes in the Church of Ireland funding the shortfall in Bob’s stipend. a manner that honours God. 7 It was for the sake of the Name that they went out, receiving no help from the pagans. 8 We ought therefore to show hospitality (generously) to such people so that we may work together for the truth. We as a Parish should truly rejoice to be in such a partnership and should seek to build on this and other similar partnerships in the future, if we are to be faithful to the call of the Scriptures. Archbishop Carey, speaking at the Lambeth conference of 1998 said: ‘The Church, whether the Parish or the Diocese is not being Church if it is not engaged in mission across the nations of the world’. Mission is not an option before the Lord and what a comfort it is to sense that we are being faithful in working with Bob and Jane Hurley through ICS, which is a mission agency under the Patronage of Richard, Archbishop of Armagh. Bob and Jane are working with a mainly student congregation of about 60 people, from all parts of the world, and from all faiths and none. Bob speaks passionately about his work with a group of Nigerian prostitutes, as he brings them the good news of Christ; this ministry has led to a number of both adult and child baptisms. Bob also brings us stories of Muslims coming to the Church because of hospitality being offered and them finding faith in Christ. This is such a blessing for us as we partner Bob and Jane in this work of the Gospel. 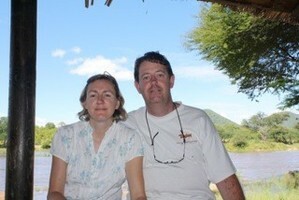 Please pray for Bob and Jane and take the opportunity to write to them, and to encourage them at Christmas. I ask you to humbly give your blessing to this partnership in order that it may become a living relationship of faith, hope and love.